Yesterday, word leaked that Governor Jerry Brown was finally submitting his own plan to try and fill the state’s looming $59 billion funding hole. His plan, a mix of fee increases, tax increases and funding from the state’s cap-and-trade funds, would raise roughly $3.6 billion per year. Critics on the left say the plan is not enough, business interests say the state needs to raise at least $6 billion per year. Critics on the right refuse to support any plan that includes new taxes and fees. For a new fee to pass, it needs the support of two-thirds of the legislature, meaning Brown needs a couple of Republicans to join the Democratic majority to pass the increase. Here’s a breakdown of how Brown will raise the fees, if his plan goes through. Leave your thoughts in the comments. Oh, and the legislative session ends on September 11; so whatever is going to happen has to happen soon. 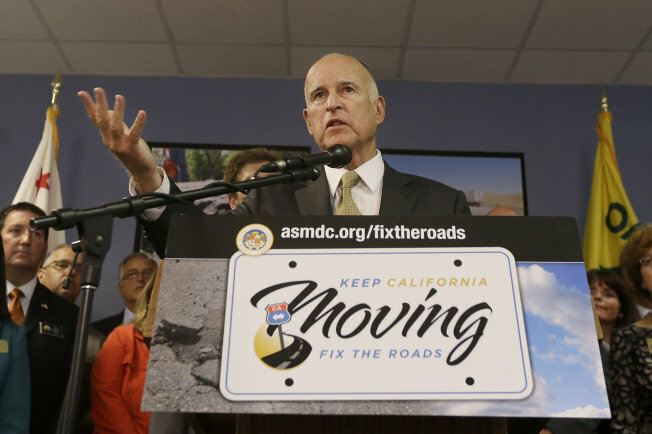 $400 million annual allocation from state’s cap-and-trade funds. In SoCal I’d argue The Transition should be accelerated ASAP. Billions upon billions are currently being squandered expanding capacity on the 405 & 91. LA has plenty of great alternatives to mass Motoring already. Angelenos just need to learn to stop thinking living 15 Miles from work is nearby. Agree in the sense that any subsidies removed for drivers be done so incrementally as we build more mass transit infrastructure. Give people more transit options and accessibility before penalizing their choices (of driving). Los Angeles has so much potential, yet budget priorities are spent on our schools, city pensions, and public welfare that unfortunately drain more of our financial resources than give back to the community. Good point really. I think a new attempt at building cities in America should start small (ish), and stitch them together later, as opposed to trying to dream up megaprojects. West LA is a large area which could Support decent transportation. Sure there are areas of SoCal Which have low density, but large areas are high density. Compare that to the 11th arrondissement, 1.4 square miles, 150,000 people, about 100,000 people per square mile. Nice cherry picking. A quick google search tells me that West Los Angeles (12,061ppl/ sq mile) has nearly 5 times the density of Los Angeles (2750 ppl/ sq mile). agree there should be a transition period (of perhaps a decade) in which the subsidies for mass motoring are gradually eliminated. however, the sooner we start eliminating the subsidies the sooner we change for the better. Of course not. But it’s very draconian to punish drivers with taxes/disincentives while our infrastructure still forces most people to drive. I support mass transit and mixed-use dense buildings but it’s hard to get people out of their cars when there is still strong land-use separation and NIMBYs holding back much needed mixed-use dense infrastructure. Actually, drivers are paying the price now for sticking with their cars: longer congested commutes and hours wasted in traffic. We all created this, both ourselves and our previous generations – not just the drivers today. If you want change, better to prioritize the values you want to see in the next politician you vote for (and I hope that you do vote). you suggest that continuing to lavishly subsidize mass motoring is sensible ? When thinking about ridership, we must consider the relationships between primary and secondary uses and their geographical locations to each other. For example, Bradley (previous LA mayor) and Baxter (previous LA County Supervisor) where supporters of mass transit rail decades ago. Bradley wanted a subway from downtown to West Los Angeles and Baxter fought for a more regional approach (having grown up to the Pacific Red Cars). The conflict of interest resulted in a compromise where we have the Blue Line today. The Line is regional in nature (DTLA to Long Beach) while helping the LA lower/middle clas residents access major employment centers. That’s why ridership is so high. Good old population growth, suppressed lagging housing growth (NIMBYs/zoning), and the auto-centric fueled policy of land-use separation is the reason why the Blue Line has seen so much growth. It’s not because people simply think trains are greener or sustainable. Many lower income residents find it more affordable and easier accessible to jobs. What I’m saying is that with limited land space becoming more of an issue as the population continues, we need to promote mass transit use for EVERBODY and not only for specific classes of people. This means buildimg more taller and dense, especially near mass transit stations. Well I guess everyone is entitled to their opinion, but the facts don’t seem to agree with you. Most of the route for the Orange and Blue lines definitely does NOT consist of buildings that are even 5-7 stories in height, yet both of those are among some of the highest ridership corridors of their type in the country. To say nothing of many other bus lines that are also consistently jammed. Transit also would be non-existent in many European cities if that were true because most buildings really aren’t that tall their either. I understand what you’re saying but it’s also you expecting a “quantitative” answer. It’s more than just numbers. The spatial relationships of primary/secondary uses are key as well. Think of this as a qualitative aspect. Improving service to increase ridership in my opinion is important, but what is more important is to prioritize building mass transit within dense mixed-use areas. Mass transit into low-rise 5-7 story building communities is just too anemic in my opinion because the only aggregate businesses you get are the first floor retail. What we need are mid to high rise towers with multiple floor retails next to mass transit stations. Well, you were the one who kept saying that it’s “not dense enough”, so I was hoping to get an answer on what exactly that means and what is “dense enough”. As for transit use, improving service improves ridership. This has been seen numerous times, including in the “not dense” San Fernando Valley. The Metro Orange Line opened and ridership has increased to the point that Valley leaders are asking that it be converted to light rail. That’s all because Metro improved service, including with the bus-only lanes. The likelihood of that happening without the improvements is small. Extending improved transit opportunities to areas that are currently lacking or have lackluster service now will also increase ridership in those areas, especially with the use of dedicated lanes. But that’s the problem with using the “scientific” approach of urban planning; using quantitative measures when cities in themselves are organic and thus constitute far more intertwining variables. There is really no right density quantitatively” until you consider the mixed-use and transportation factors. The “critical density” however is that whose aggregate density allows local economies to be viable and sustainable which do not depend on customers who have to drive there. It sounds like we need to come up with a definition of what “dense enough” means because all the places you keep mentioning definitely aren’t rural. So what exactly constitutes “dense enough” for you? For reference, of the places you just mentioned, San Marino has a density of 3500/square mile, the San Fernando Valley is coming in at over 6900/square mile, and 9000/square mile live in Long Beach. Mixed-use buildings are nice, but aren’t really all that necessary either. Good transit works fine even in sprawl, as evidenced by the ridership of the Metro Orange Line or even Green Line. Providing connections to that transit by other modes makes it even better, something that is pitifully lacking everywhere. Additionally, the spatial use isn’t a drastic problem, it’s the fact the development is solely auto-oriented. Most communities, especially the newer ones, have a shopping opportunities, schools, etc. within at most, two miles straight line distance of all the residences. But because of the auto-oriented nature, the easiest and most direct access to those locations is by car and opportunities to walk, bike, or use transit might not even be complete. While plopping down a couple pastel buildings with shops and lofts be an interesting addition to a community, that will do nothing to address the auto-centric environment in which they exist. Not dense enough in many areas. Korean town, yes. Various San Fernando Valley districts, no. Even in areas outside of LA within the county, you got wide disparities of density from San Marino to Long Beach. I can agree with you about the majority being auto-oriented. As for transit-only lanes, that’s only one piece of the puzzle. They key in ridership are the busy routes between and among primary and secondary uses. Mixed-use buildings and their spatial relationships with mass transit and employment hubs are far much more critical factors than focusing only on transit lanes. Bout time Gov. Our nation has some some of the lowest gas tax for transportation out of just about any other nation (except for Mexico). No wonder everyone is driving solo in rather large cars! Sure would be nice to see us fall more inline with all the other industrialized countries! Yes, they’re dense enough. The problem is that they are almost all designed to be exclusively auto-oriented. As a result, transit gets bogged down in the ensuing traffic. Many could see far better transit performance just by repurposing existing lanes to be transit-only or transit/right-turn only lanes. In turn, the better performance will attract ridership, lowering the ensuing use of the roads. Southern California is dense, it’s just sprawled. The two are not mutually exclusive and many of SoCal’s “bedroom communities” have densities of over 3500/square mile and most are big enough to require their own MPO if they were outside the region. As a reference, even a low-density residential zoning of just 3 du/ac with an average occupancy of 2.2 per unit yields a density of over 4200 people per square mile. Many newer developments all over the region are proposing to build housing with numbers into the teens or even mid-twenties. This is more of what I was thinking. I know building more alternatives a huge part of getting away from an auto-centric world, but while there are incentives for mass transit, at the same time there need to be disincentives for automobiles, with a consistently discouraging gas tax. That might or might not be the case, but tying a fixed dollar-amount fee to inflation is just basic financial math. Otherwise, the purchasing power of a tax defined in such way (the federal and most state gas taxes, for instance) erodes, as anything else, with inflation over time. Effectively, there has been a cumulative gas tax cut on the order of almost 40% since 1987. Among the 10 American metropolitan areas with highest population, Los Angeles is the third most dense overall. It doesn’t have mid-density neighborhoods like some older metros, but then it doesn’t have very low density areas like you find in the outer suburbs of New York, Boston or Chicago, which then pull down the overall density of those metro area. Then, many people seem to completely forget the extremely low density patterns of the outer suburbs of these “transit-rich dense cities”, as if they were not an inextricable part of the larger urban system (metro) they are attached to. Southern California is anything but dense. No it wouldn’t. Let’s be realistic. As much as we may hate dependency on cars, we are stuck with the auto-centric infratructure we have now. It’s been decades in the making and thinking tht we can financially burden drivers when other alternatives are scarce is ridiculous. Let’s build up our mass transit first, and as quickly as possible. Then later when other alternatives are more plausible should we tax more against drivers. Dense but not dense enough and not really mixed-use and walkable. We are making many more mixed-uses now, but the mass transit infrastructure is lacking. We need to invest more in mass transit. What are you taking about lunartee? Taxing the suburbs? And triggering another secession movement like that in San Fernando Valley? Equitable distribution? How about accepting the fact that people are DIFFERENT and the fact that there is a general movement in Southern California to limit growth (including zoning) that makes the poor move out further until housing becomes cheaper. Again, think about SFV secession movement. They didn’t feel they got the “equitable distribution” compared to southern Los Angeles considering the taxes they already paid to the city. Please understand, people are DIFFERENT and forcing “equitable distribution” is anything but a democracy. Ignoring the fact that most every city in SoCal is already decently dense as it is, transit and active trans can work quite well in suburbs and rural locations. In fact, the combination of the two makes them both operate that much better. Agree but that won’t happen without the infrastructure (dense walkable communities) to go along with it. Middle class is everyone else who isn’t feeling poor yet but is getting there thanks to more government taxes triggered by wasted spending. Read the LA 2020 report, we are a BARBELL economy. I’d be open to a tax on the sale of new bicycles to maybe supplement any active trans programs, but mostly to shut up that complaint from motorists. With improved transit options and active trans infrastructure, there will be alternatives to driving. Want to fix our roads Governor Brown? Quit spending billions on welfare and for illegals. Bring our businesses back and make this State a great place for the MIDDLE CLASS. What we have now is a state that caters only to the poor and rich! We’ve created a really unfortunate system. Years ago it would make sense to heavily tax people who chose to live far outside of cities to live in big suburban homes. However, things have changed and now it’s some of our poorest people who are stuck driving 40 miles into town for work. It’s a very difficult task to develop a plan that equitably distributes this cost without harming the budgets of some of our poorest citizens. “Pinning the gas and diesel taxes to inflation so that it rises with inflation” would be incredible. The administration’s funding approach seems reasonable enough, although it would be nice to see more movement towards user fees (i.e., roadway charges) for motorists. What this casual observer doesn’t yet see– and here, I’d be happy to be enlightened– is a strong alignment between the new funding and important policy goals such as GHG reductions, equity, safety for all roadway users, and health.